A frightening world is painted here. Nuclear war has decimated the earth. Many were killed in bombings. More died afterwards, largely from disease. This disease brought the ratio of men to women to exceedingly low levels. And so the government of what was once Pakistan has introduced measures to ensure the birth of more children and the continued existence of society. Marriage isn’t a think of love, here. It is a necessity, an inevitable factor in every young woman’s life. They will be married, to more than one man, constantly pregnant and caring for the home. It is a world where women have no autonomy and no real future. But, as always, there are those who resist and dream of a better world. This alone paints a bleak, depressing, frightening picture. Love is a thing of the past, as is religion. Yet, in other ways, this is undoubtedly a futuristic world. Electronic devices are common. The city, called “Green City”, is flourishing despite the nuclear winter which occurred only a couple of generations earlier. A resistance has formed called the Panah. It’s small, secluded, camped in the forgotten bunkers that saved humanity long ago during the war. It is these women, these resistors, who narrate the tale. The story, while very focused, encompasses the span of many years, at least a whole generation. Chapters tend to be short, and switch between several different character’s points of view. We see glimpses of their childhoods, the moments when they fully understand the sorts of lives they will have and what is expected of them, and their escapes. I particularly liked the chapters focused on the woman who first began this resistance, the niece she passed it on to, and what they needed to do in order for their underground resistance to survive. The Panah isn’t simply some wishful resistance force, though. They are a group of women who slip out at night and provide companionship to men. And not that sort of companionship. In a world where love and comfort are more distant memory than anything else, they provide a facsimile. The men who call for them simply want to fall asleep cuddling with another, small talk and morning breath included. This is both a very interesting concept, and understandable given the state of their society. I did have some questions about the Panah that weren’t answered, though. For example, how word of it spread so far when there were so very few. Why more people didn’t try to make to them, and, maybe more importantly, why they didn’t try to rescue more. Still, the women who run the Panah are portrayed as incredibly human. As strong as they are, they are still people with flaws and fears who make mistakes. Towards the end of the novel, some of the books conventions begin to change. New characters are introduced, most of the men. Some established characters begin to act for their own benefit as opposed for that of the Panah. On the whole, though, we hear much more from the male perspective. While it was nice to see some men within the tale who weren’t portrayed as monsters and to have the cruelty of this society acknowledged by those who would otherwise benefit from it, I did feel as if the women had taken more of a backseat role. It seemed a bit counter intuitive to the point of the novel in having the men be the ones largely in control of the second half of the narrative. I would have liked to see the women, our main characters up until this point, be the ones driving the story. However, this novel kept me hooked the whole time. It would be interesting to see more set in this universe. I’m a sucker for a dystopian world, and the setting, political system, and post-apocalyptic scenario were very intriguing. I’d love another look at this world. 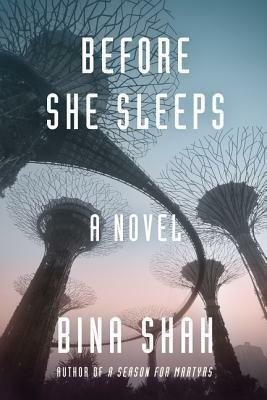 Overall, Before She Sleeps by Binah Shah is a fascinating look into a society which suppresses and mistreats women. If you like feminist dystopian novels, this is a book you don’t want to miss.